← Let’s get quizzical: How well do you know your Eurovision lyrics? 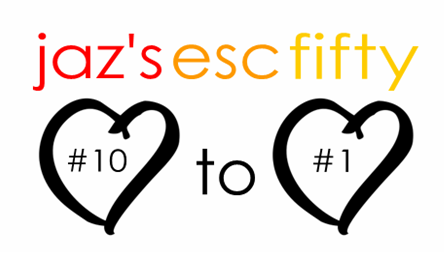 My all-time ESC 50: the Top 10 revealed! Alright. I think I’ve kept you waiting long enough. Granted, I did mean to post this three or four days ago, but life kind of got in the way (damn you, life!) and so here we are. It’s well and truly time to bring this countdown to an end and put all of you out of your misery in the process, because I know* you’ve been glued to your wifi enabled devices for the last 96 hours straight, praying to the Eurovision gods that I would post the last part. I’ve decided to say less than usual about each song, simply because when it comes to the ones you really, really, REALLY love, you shouldn’t have to justify that love with a ramble (as much as I adore rambling). I’ve said a few words, but I’m mostly letting the songs speak for themselves. Let me know what you think of my choices, as well as which entries would make your list of the best-ever. * I may or may not have accidentally typed ‘I know’ instead of ‘I like to think’. Whoops. Are you sighing after me somewhere? Where are you hidden from me? This is the moment! If I didn’t think you guys had already guessed what my favourite was, I’d ask for a drum roll. Voila! I hope you’ve enjoyed the countdown. Posted on August 19, 2012, in Random Stuff, Top 10's and tagged best Eurovision songs ever, ESC, Eurovision, Lane Moje, songs, Zeljko Joksimovic. Bookmark the permalink. 10 Comments. Wait, so “Fangäd en stormvind” Isn’t even on the list? That’s how fickle I am! If I redid my favourite winners list it would no longer be on top. oh yay finally! I almost died while waiting…and then I almost died again because OMG LANE MOJE, KEINE GRENZEN AND BISTRA VODA?!?!?!?!?!?! Well, I guess I don’t get to bash your top 50 too much. I guess I could bash it for including Suus, but the fact that you have Lane moje first, Bistra voda in your top 5 and both of Ich troje songs makes it up for Suus xD I’m seriously surprised, most people seem to dislike ich troje! As for the entries that would make my list, those in the video I showed you (especially Bosnia 1999, Romania 2006, Spain 2003, Turkey 1997, Serbia 2008 and Norway 2006) + Bosnia 1993, Poland 1997, Cyprus 1998, Israel 1978, Yugoslavia 1990, ugh I don’t know there are too many! I’m sorry I nearly killed you =( It was totally unintentional I swears. Putnici, Tornero and Dime…oh how I agonised over whether to put them in my 50 or not!! As much as I loved Pastora this year I really want Spain to send go back to the Dime-ish type stuff. I don’t know why, but I’m surprised you like Alvedansen so much. But I’m totally unsurprised about Cyprus ’98! PS – I think you have the right idea re: not wanting to rank songs. It’s so traumatic. Why yes. Yes it does!! Looking forward to it already. & Bistra Voda & Lejla also =o soo great. Lane Moje = kadhfh/ef/lh/hflfeklahewdgyQTSW6TGEGWKFDNBJSBjncdsaklc + goosebumps + more crazy letters. Thanks for reading. That makes you awesome too!! Ahaha.